When I was in high school… yes, we’re going back to the stone age again… all the girls took home ec. The boys were more apt to be in shop or something. I think that’s changed these days and some schools have all kids take home ec at one time or another. That’s good, but myself, I think it would be excellent for both boys and girls to take both home ec and a class in basic car and home repairs. You know, how to check the oil in your car, how to check circuit breakers. Basic stuff. But I digress. I meant to regress. Back to high school and my home ec teacher who told us to watch for signs of botulism in canned food. One of those signs was bulging cans. Do you think this qualifies? Botulism or not botulism, that is the question! Botulism from commercially canned foods is actually pretty rare in the U.S. these days. Typically, commercially canned foods are heated long enough and to high enough temperatures to kill the spores that otherwise can grow and produce the toxin. However! If for some reason the canned foods are under-processed or the cans are defective, the bacteria can thrive in the oxygen-poor environment inside the sealed containers. It’s more common for botulism to be associated with home canned goods, and usually because they were under-processed and didn’t kill off all the spores. And there I am, up close and personal taking a picture of this bulging can… when I first read this, my hope was I didn’t breathe deep if there were any bugs there! 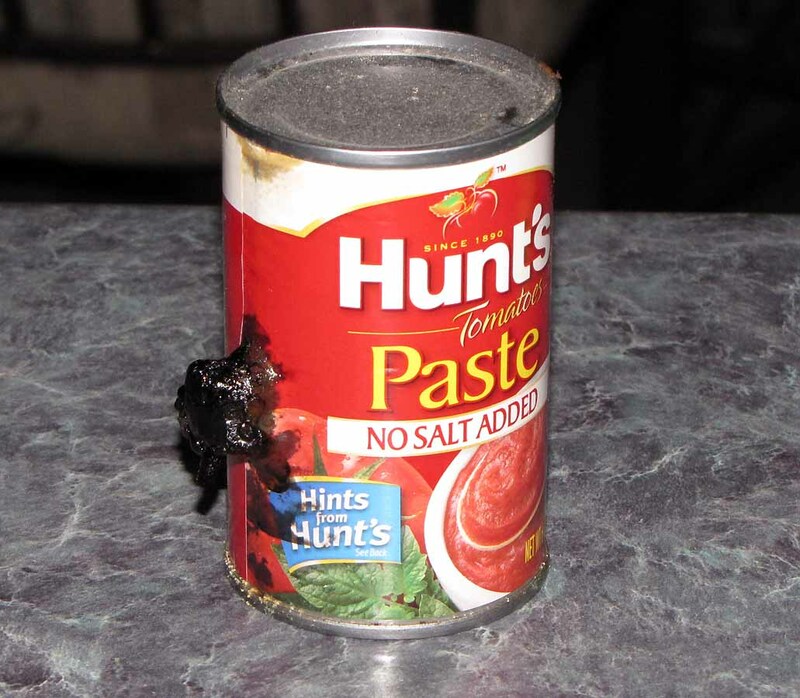 Inhalation botulism : This form happens when the pure form of the toxin is breathed into the lungs. It would seem likely that most people get botulism by eating contaminated food. But if you’ve been unfortunate enough to eat something contaminated with the bacterium, Clostridium botulinum (C. botulinum), below are some symptoms caused by botulism. dry mouth and muscle weakness that moves down the body. The paralysis can become so bad it causes a person to stop breathing and die, unless supported by a ventilator. Botulism is fatal in about 8 percent of cases. However, most victims eventually recover after weeks to months of care. And just think how many people are getting injections of a version of this stuff for wrinkles! Yeah, I know, Botox is actually type A botulinum toxin and at first if was just used for spasms and stuff where it helped to paralyze the muscles. But then people noticed that paralyzing muscles locally could also reduce the signs of wrinkles and produce overall smoother skin, and Botox quickly became a popular treatment for wrinkles and a mega-lucrative industry was born. I think I’d rather have wrinkles. Now obviously, if you think YOU have been exposed by eating something contaminated by botulism type bacteria, you ought to seek medical help! But back to the bulging can of tomato paste. So how’d it get that way? Well, this particular can had been sitting on a shelf in our basement for a very long time. I rarely go down there to look for canned food to use for meals these days, so it was sort of forgotten. Whether caused by botulism or not, I don’t think we’ll eat it now. Wanna See Some Gross Eggs?